As I mentioned in a previous post, I ran a blacklight with a sheet on Friday night. The blacklight brought in a lot more moths than I normally see; I counted at least 27 individual moths, not including some very tiny ones that I did not photograph or collect. That is easily the most I have seen in a single night. I already posted two moths from that group, a Large Yellow Underwing and a Yellow-striped Armyworm Moth. This post has a few more of the moths that I identified so far. The first is an Elegant Grass-veneer (Microcrambus elegans), a member of a distinctive subfamily of crambid moths. While members of the group can be difficult to identify, the group as a whole is easy to recognize because of their triangular shape, relatively long snouts, and similar banding patterns. Moths in this group fly low to the ground and are sometimes among the insects scattering from a grassy trail. This Bluegrass Webworm Moth (Parapediasia teterrella) is in the same subfamily but is less boldly marked. This crambid was a new species for me, a Spotted Peppergrass Moth (Eustixia pupula). Another crambid was the Lucerne Moth (Nomophila nearctica), which I managed to catch with its wings unfurled. This moth gave me some trouble because I was not able to find a close match among the various reference images. Eventually I settled on Speckled Rustic (Caradrina multifera). Even though this individual is darker than images at BugGuide, the shape and the other markings seem to match fairly well. This moth is another noctuid, The Wedgling (Galgula partita). I previously found the red form of this species at the same location. The species is sexually dimorphic, with the lighter forms corresponding to males and the darker forms to females. This moth appears to be a Common Eupithecia (Eupithecia miserulata), a geometer moth. Moths in this genus have distinctively long forewings held perpendicular to the body. I had some trouble identifying this individual because the Eupithecia moths look very similar to each other. The last moth for this post is a Suzuki's Promolactis Moth (Promalactis suzukiella). According to BugGuide, this species has not been officially recognized in North America. The species was probably introduced from Asia, but more research is needed to determine whether the Asian and North American moths are the same species. All of the photos for this species on BugGuide come from four states on the East Coast: New Jersey, Pennsylvania, Maryland, and Virginia. One of the advantages of the blacklight was getting a better selection of noctuids, such as this Yellow-striped Armyworm Moth (Spodoptera ornithogalli). This one gave me some trouble when I tried to identify it since it looks similar to a few other groups of noctuids. Luckily, someone at BugGuide set me straight. I will continue posting more moths as I get them identified. Two nights ago I used a blacklight and sheet to lure moths for the first time. The highlight was this Large Yellow Underwing (Noctua pronuba), which showed up around midnight. This species was introduced from Europe in 1979 and has since spread throughout the continent. This view shows the forewing markings a little better. I had a brief glimpse of the hindwings – yellow-orange with black bands. Unfortunately the glimpse was not long enough to photograph them. I recorded some other moths that night, and I will post them as I get them identified. When I came upon this scene, what caught my eye was the bug in a strange position. I bent down to take a photo so that I could identify the bug, and then I noticed that it was dead. A crab spider had caught it by the neck and was slowly sucking out its insides. This crab spider was very well concealed. It had positioned itself just under the fold of the milkweed leaf, so that it was difficult to see from above or under the leaf, but it could easily grab an unsuspecting insect. On a nearby plant, two Small Milkweed Bugs were back-to-back, presumably mating. Generally when I see red meadowhawks, they turn out to be Autumn Meadowhawks when I check the identification books. In this case, it could be one of three species present in New Jersey: Ruby Meadowhawk, White-faced Meadowhawk, or "Eastern" Cherry-faced Meadowhawk. According to the New Jersey Odonate Survey, these three species cannot be separated in the field in the state because of variability in appearance. It sounds weird to describe a damselfly as easier to identify than a dragonfly, but in the case of these two individuals, it is true. This is a Slender Spreadwing, recognizable partly by the dark gray segments at the end of the abdomen. It can be difficult to watch Eastern Tailed-Blue butterflies through binoculars, let alone photograph one. Yesterday I was lucky enough to photograph two together as they gathered nutrients from mud. I was also lucky enough to photograph an individual with its wings open; I rarely get the chance to see the upperside of this species's wings. I like the very faint hint of blue along the leading edge of the forewings. Finally, here are two Pearl Crescents to go along with the two blues. The Houston Zoo and US Fish and Wildlife Service are trying to rebuild the Attwater’s Prairie-Chicken population along the Gulf Coast through habitat restoration and captive breeding. A study of Barn Owls shows that healthy owl ears can distinguish the source of a sound from its echoes. Bird tracker Arlo Raim was killed by a freight train while studying the effects of increased rail traffic on Northern Cardinals in a forest bordering the train tracks. Europe's rarest seabird, the Zino's Petrel took a blow to its population when a forest fire on Madeira killed three breeding adults and 65% of this year's chicks. The species consists of only 80 breeding pairs, and the island is its only breeding site in the world. Homosexual behavior among birds generally does not reduce reproductive success; it tends to be more common in whichever gender spends less time caring for young. A new book documents the world's 50 rarest birds. The link has a gallery showing 15 of them. A rare cuckoo species, the Sumatran Ground Cuckoo, was recorded on a camera trap after the species had gone undetected since 1916. Recordings of the dawn chorus are being used to calm children receiving treatments in Liverpool's Alder Hey hospital. Great Swamp NWR is a prime spot for watching fall bird migration in central New Jersey. The Scottish Society for the Prevention of Cruelty to Animals wants to stop the hunting of young Northern Gannets in the Hebrides. 10,000 Birds: Broome….birds, beaches & beyond. Drew Wheelan reports on the migratory shorebirds arriving on contaminated beaches and marshes in the Gulf. A particular problem is that layers of oil are still present underneath the surface of the beaches. A panel investigating the disaster is still having trouble figuring out who was in charge of the drilling rig and responsible for the explosion and spill. BP has decided not to join the oil rush in the Arctic because of the political problems that would create in the wake of the Gulf oil spill. The government is still working on a restoration plan for the areas affected by the oil spill. A writer explores problems with the contemporary green movement, particularly the willingness of many environmentalists to sacrifice wilderness areas or wildlife in the name of clean energy or "sustainability." A new study finds that coal ash dumps from power plants contaminate ground water and streams with unhealthy levels of toxic chemicals and heavy metals. Some visitors to national parks are using cellphones or GPS devices are straining the park system's emergency response resources by calling emergency numbers in non-emergency situations. A tiny, pea-sized frog (Microhyla nepenthicola) was discovered in a pitcher plant on Borneo. The species lives its life cycle in the pitcher plants: the frogs lay their eggs on the plant, and tadpoles swim in the plant's liquid. A proposed highway through Serengeti National Park could disrupt the annual migration of wildebeest and zebra and isolate it from Kenya's Masaai Mara National Reserve. Conservationists are arguing for a southern route around the park. Please send me submissions for I and the Bird #133 by Tuesday, August 31. You can email me at empidonax@gmail.com. In "Julia," the Lower Mississippi Riverkeeper Boston Whaler and a local fishing vessel we made our way south from Pointe Au Chien across Lake Chien and Lake Felicity to Modoto Island. What we encountered there stunned us all. The ground was littered with dead birds. So many dead birds that we aren't sure how many were out there, many dozens of dead birds just in the small area which we surveyed on the island. The dead appeared to included mostly seagulls and terns though some were badly decayed and identification was difficult. It was clear to me by the various states of decay, from scattered bones to a tern that couldn't have been dead for more than a day and everything in between, that this is an ongoing situation. We also saw a juvenile gull that was in distress. It could hardly walk and was very unsteady when it took a step it also had very little energy. By the time we finished our sampling and were ready to leave the island the bird had died. I asked Kurt if he had seen anything like the dead birds and he said that he had been visiting this island his entire life and he has never seen dead birds in the numbers we were seeing. It is clear to me that these birds are somehow being poisoned by the BP event. You can see video of the gull in question at the Riverkeeper's website. Even though the well is basically plugged, and even though deep-sea bacteria have started to break down some of the submerged oil, much of the oil is still out there, and wildlife is still being harmed by it. Yesterday I covered the distinctive moths that came to my porchlight last week. Besides those moths, there were several rather plain or cryptic moths. The first is the moth above, which is the most boldly marked of the group. I have this one narrowed to two similar species: Scoparia basalis and Eudonia heterosalis. It seems more like the former, but I am not sure how to distinguish the two. As a side note, I am also not sure what happened to this moth's antennae. When I posted this moth on BugGuide, two people responded with suggestions that it might be an Acorn Moth (Blastobasis glandulella) or another species in the same genus. While this is not quite an exact match for Acorn Moth, the pattern looks very similar and we do have plenty of its larval food source. One other moth from the same night looks very similar and might be the same species. I am still not sure what this moth is. My best guess is that it belongs among Gelechoidea, but its pattern is very cryptic. It looks very similar to a moth I food indoors in January. This moth is also still unidentified. It looks very similar to a moth I found indoors a few weeks ago. These little moths can be very tough, so I usually wait until after identifying the larger ones to work on them. Update: I think that the last moth is a Household Casebearer (Phereoeca uterella). Last week I gathered moths at the back porch light again. Here are some of the moths that showed up. This is a Yellow-fringed Dolichomia (Dolichomia olinalis). This is the second visit I have had from one of these moths; the first was in late June. Larvae of this species feed on oaks, which are plentiful in my neighborhood. One thing I have learned in my short time mothing is to look for distinctively-patterned moths shaped like this one in the Pyraloidea. That helped me identify the Pondside Pyralid Moth relatively quickly on Sunday. Another return visitor was the Small Mossy Lithacodia (Lithacodia musta). The last visitor from this species was in early June. I really like the green and brown patterns on this moth species. I have seen Celery Leaftiers (Udea rubigalis) in other places, but this one was new for the yard. Green Cloverworm Moths (Hypena scabra) are very common in this area. Last week I had three in one night. Their triangular shape combined with the triangular dark patches on their wings make them easy to recognize. Florida Tetanolita (Tetanolita floridana) was a new species for me. Tetanolita moths appear very similar to the Renia moths that I encounter frequently, but they lack black dots with the orange spots on their forewings. In addition to these, there were three Ailanthus Webworm Moths and a few micromoths that I have not identified yet. I met with Patrick yesterday to do some birding around the lower Raritan watershed. Middlesex County is well positioned to attract a diverse bird life as it straddles the boundary between Piedmont and coastal plain. It is also densely developed. This means that patches of habitat are likely to be relatively small, especially compared to more rural portions of the state. Unusual birds are likely to be fleeting visitors during migration or tucked away in some swamp or pond. Our first stop was a large pond near Raritan Center, which had a lot of waterlilies but few birds. A lone Green Heron was the only highlight. From there we went to Woodbridge River Watch, a small marsh. By this point it was starting to drizzle, and the rain would continue for most of the morning. We had hoped to see a Red-headed Woodpecker, which had been reported from the site on previous occasions. That bird failed to materialize, but we did see a handful of Least Sandpipers, a Lesser Yellowlegs, and a Northern Waterthrush. There must have been a few dozen robins just in the entrance to the park. That seems like a high concentration for this time of year. We left Woodbridge and headed for South Amboy. The short strip of shoreline that runs from South Amboy to Laurence Harbor faces Raritan Bay and is the best area of the county to find coastal birds. At the Morgan Ave beach in South Amboy, we found a large group of gulls loafing on the shore, along with a few Semipalmated Plovers and a Least Sandpiper. We stood and scanned a bit to see if anything else would fly past. As we waited, I noticed one Herring Gull bearing 3rd winter plumage. 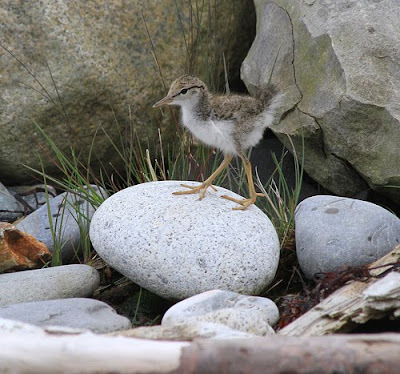 Eventually, our patience was rewarded with a Spotted Sandpiper, a Willet, a couple Common Terns, and a Royal Tern – the last an excellent bird for the county. Our next stop was Waterworks Park, a large pond behind the South Amboy waterfront. Pied-billed Grebes have been reported breeding here in the past; we did not see any grebes, but we did see six Wood Ducks on the pond. We also heard a strange vocalization that sounded somewhat like the croak of a night heron and somewhat like the grunts of a rail. Unfortunately we never saw the bird, so we could not identify it for certain. Other bird life included a Ruby-throated Hummingbird and an American Goldfinch that sang continuously as we scanned the pond. By the time we got to this park, the intermittent drizzle had stopped and the clouds had broken, so that a lot of insects were active. These included some odes; I noticed Common Green Darner, Blue Dasher, and this Fragile Forktail (Ischnura posita). Nearby was this Pondside Pyralid Moth (Munroessa icciusalis). A patch of blooming pokeweed and porcelainberry attracted many bees and wasps along with other pollinators. A highlight was this Katydid Wasp (Sphex nudus), a southeastern species that is near the northern end of its range. There was also a Northern Paper Wasp (Polistes fuscatus). Our last stop was at the eastern edge of Middlesex County, a beach in Laurence Harbor called Pirates Cove. This spot has a good view of the bay and the mudflats at the mouth of Whale Creek. There were a lot of Least Terns gathered along the beach. Many of them were immatures, including several that still had much of the juvenile plumage. They had grown enough of their immature plumage to fly, but their backs were still covered with downy brown feathers. I counted 28 on either side of the jetty. In addition to them, there were a few Common Terns, some of which were also very young, and a large flock of Laughing Gulls. Shorebirds included Semipalmated Plovers, several Sanderling, a Willet, and an American Oystercatcher. After scanning a bit more, we packed it in for the day. I added six new county birds yesterday: Northern Waterthrush, Royal Tern, Common Tern, Willet, American Oystercatcher, and Least Tern. I think Patrick added a few for his county list, too. Despite occasional drizzle and some avian no-shows, it was a fun and successful morning of birding. It is unusual for me to see and record more butterflies than birds during a walk, but exactly that happened yesterday at Negri-Nepote. I recorded 14 bird species and 15 butterfly species during a short walk around the first meadow. In addition, there were at least 7 species of dragonflies, though there were probably more that I missed. Most of the dragonflies and butterflies, such as the Black Swallowtail above, were active around the preserve's pond, which is now barely a mudhole thanks to the lack of rain. Each time I have visited the preserve this summer, the water level has been smaller; now there is hardly any. Even though I was more focused on the plentiful insects, I still saw some interesting bird activity. One of the highlights was when this flock of Mourning Doves had a sudden and unexpected visit from an American Kestrel. The kestrel flew straight through where the doves were perched, doves scattered in all directions, and the kestrel perched on a snag nearby (below). The doves probably did not have much to fear from the kestrel, which is about the same size as a Mourning Dove and usually hunts large insects and small rodents, but they acted from instinct anyway. Speaking of raptor activity, a young Red-tailed Hawk was hunting in the meadow. There is a Red-tailed Hawk nest in the preserve, so if the pair nested successfully this spring, this may be one of their offspring. This young hawk seemed uncertain in its movements. In one case, it hovered, then dropped a little, hesitated, then dropped a little more, hesitated again, and then finally dropped to the ground and out of sight. When it emerged again, it did so with empty talons. Red-tails often hover hunt but usually strike more decisively than this bird to preserve some element of surprise. Young raptors usually have the instinct to hunt but not the skills to do it successfully, which they learn through trial and error. (It may be mostly error since 70% of raptors die within their first year.) They need to learn both what types of prey are appropriate and the best techniques for catching them. This young hawk is probably still learning. This video of a displaying male Spoon-billed Sandpiper was filmed by David Erterius in Chukotka in June 2010. Spoon-billed Sandpipers are critically endangered due to habitat loss across their range and other factors. This individual failed to find a mate. 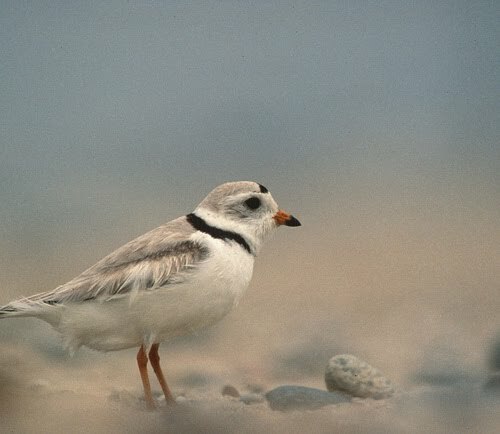 A federal judge ruled that the US Fish and Wildlife Service followed the law in designating part of Cape Hatteras National Seashore as critical habitat for endangered Piping Plovers. The decision was under attack from ORV users who are upset that a portion of beach will be off limits to their vehicles. An analysis of extinct "terror birds" (Andalgalornis steulleti) suggests that the birds' bills were structured to give sharp, straight-on blows but not side-to-side rips. You can read the full paper at PLoS ONE. Several New York City skyscrapers will be dimming their lights during the peak of migration this fall to prevent bird collisions. British Greenfinch and Chaffinch populations have suffered from a repeated outbreaks of trichomonosis, a disease that first emerged among finch populations in 2005. The disease is usually associated with pigeons and doves. The study is reported in PLoS ONE. Woodpecker expert Jerome Jackson reviews the Ghost Bird movie. Polar bears have been eating the eggs of Barnacle Geese. The behavior seems to result when ice floes melt and the bears are left stranded on land. In one breeding colony, only 40 of 500 nests were successful as a result of predation. Conservationists have been successful in building artificial nest structures for kingfishers. Birds, Words, and Websites: Who Are The Next “Great” Birders? A senior scientist from NOAA admitted that the government's report on the fate of the oil was overly optimistic. 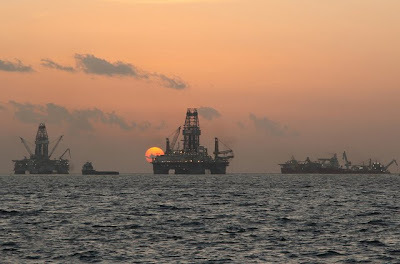 Instead, it is likely that 75% of the oil remains in the Gulf in some form. Meanwhile, a new paper in Science reported that a 22-mile oil plume remained in the Gulf at such a depth that natural decomposition would act very slowly. Toxic residue from the spill could create dead zones that harm commercially important fish species that spawn in the area. According to one estimate, the dead zones are likely to last two years. Oil buried under Gulf of Mexico beaches may have a detrimental effect on sand fleas, a food source for birds and crabs and bait for anglers. The bottom kill of the Deepwater Horizon's well has been put off until after Labor Day. Federal officials want BP to remove, preserve, and replace the blowout preventer as evidence for future court cases. Passaic Valley Sewerage Commissioners employees and volunteers recently hosted a cleanup to reduce the amount of trash along the Passaic River watershed, which includes the second-highest waterfall east of the Mississippi. A column discusses the history and landscape of Forsythe NWR. According to a recent study, urban prairie dogs spend less time foraging and more time watching for predators than their rural counterparts. The wild population of Kihansi Spray Toads is being restored through a captive breeding program. The July tied the warmest Julys on record, and the year to date is the warmest on record according to the NASA Goddard Institute for Space Studies. The global average temperature in the second half of the year may moderate thanks to La Niña. I and the Bird #132 is hosted at Great Auk or Greatest Auk, who somehow ended up in landlocked Missoula despite being a seabird. I will be hosting the next edition of I and the Bird on September 2. Please send me links to posts you would like included at empidonax@gmail.com by August 31. Submitted posts should be about birds or birding, but birds do not need to be the main subject of your site. Among the common feeder birds here are Mourning Doves, which walk under the feeder and pick things off the ground. I am not entirely sure what they are finding, whether they are picking up bits of seed that were sloppily dropped by other birds at the feeder or catching invertebrates. It might be a bit of both. While their plumage is understated, their shape and gait makes them appear more elegant than some other feeder visitors. As I was examining my photographs, I realized that this dove has two ages of feathers – in other words, the bird is molting. It is most obvious in the wing coverts: some feathers are grayish and others are brown. Which ones are newer is not as clear, but it seems that the darker ones have crisper edges while the lighter ones look frayed, so the dark ones are probably fresh. On Saturday night I left the porchlight on for part of the evening to draw in some moths. One odd thing I have noticed this summer is that I seem to get better results on cooler nights (i.e., temperature below 70°F). This seems the reverse of what should happen, as there ought to be more insect activity on warmer nights. Perhaps it is just a matter of the moths being less willing to settle down and sit still when it is really warm. In any case, here are a few of the moths from Saturday night. The first is an Ailanthus Webworm Moth (Atteva punctella). These moths are native to North America but adopted Ailanthus as a larval host plant after the tree was introduced to this continent. The moth species is very common in my area, no doubt thanks to the abundance of invasive host plants. Adults of this species often nectar at flowers. The second species is Large Lace-border (Scopula limboundata). This appears very similar to another moth species I recorded earlier in the summer, Single-dotted Wave (Idaea dimidiata). Larvae feed on a variety of plants. The last moth is a Tortricid. I think it belongs in the genus Aethes, which places it in a complex of very similar looking species. It bears close resemblance to A. promptana and A. angustana, but I am not sure that its true identity can be determined on the basis of a photograph alone. Two weeks ago, NOAA released a report claiming that most of the oil leaking from BP's blown-out well had disappeared. The government report was widely promoted in the syndicated media but was met with skepticism from environmental journalists and marine scientists. Since that time, scientists from the University of Georgia performed their own evaluation of the government's numbers and reached a much different result (pdf). UGA's report omits oil captured directly from the wellhead (since that oil never entered the water), so its numbers do not match the government's exactly, but it still offers a useful critique of the conventional wisdom. The UGA scientists agree that burned or skimmed oil can be said to have left the Gulf. That accounts for 10% of the oil that entered the ecosystem. The rest is either dispersed (naturally or chemically), dissolved, or residual. "Dispersed" or "dissolved" may mean that some oil has been degraded or evaporated, but that should not be assumed. There are no data available from the scientific literature or the National Incident Command on rates of decomposition or weathering of oil released from the BP spill. Because so much oil exists as micro-droplets in deep, very cold ocean waters, it is difficult to infer decomposition rates from studies of previous spills occurring closer to the surface. However, several scientific studies are currently underway to directly address this critical need. We asked our scientific experts to estimate, as best they could, the percentage of subsurface oil that has degraded. They suggested a range of between 5% (see Figure 3) and 10% (see Figure 2). Given that estimate, we calculated that between 168,000 and 319,000 barrels have been removed from the Gulf through degradation. This is equivalent to 4-8% of the total oil released into the water. The NIC report estimates that 1.2 million barrels (30%) of oil released at the wellhead dissolved in the water and are, therefore, in a form that could evaporate. However, for oil to evaporate, it must come in contact with the atmosphere. Without knowing how much of the oil is at various depths, it is difficult to estimate how much oil could have reached the surface in order to evaporate. Our experts set the range of evaporation at 25% (see Figure 3) to 40% (see Figure 2). Based on this estimate, we calculated that between 306,000 and 490,000 barrels of oil have evaporated into the atmosphere and are no longer in the Gulf of Mexico. This amounts to 8-12% of the total oil spilled into the Gulf. The scientists also note that the degraded and evaporated forms may not be environmentally harmless, either to humans or to other organisms. The one piece of welcome news in this report is that the remaining oil is now unlikely to enter the Loop Current and make its way along the East Coast. Update: The New York Times has its own take on the UGA report. While I have been giving more attention to butterflies and dragonflies, I have not forgotten about moths. Here are a few recent ones. The first is one I found at home, The Wedgling (Galgula partita). Males of this species are reddish or grayish brown while females (like this individual) are dark maroon or black. The larval host plant is Oxalis sp. The next three moths are from Negri-Nepote Grasslands Preserve. This moth is a species I have encountered before, a Garden Webworm Moth (Achyra rantalis). Their larvae feed on a variety of grasses and legumes. This tiny white moth is a Snowy Urola Moth (Urola nivalis). The last moth is a White-spotted Brown Moth (Diastictis ventralis). This one is nectaring at Brown Knapweed (Centaurea jacea).